Yes, it certainly can. But it can be worth it. 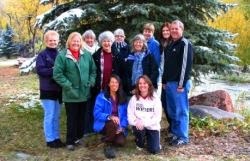 For my first retreat I paid $345.00, which included a single room, two, four-hour days of fly fishing and nearly three days of uninterrupted writing, except to eat and refill my wine glass. At the end I added over 15,000 words to my novel. There are other options, many less expensive or even free. Here are a few creative ways to find yourself with hours of quality writing time. Amtrak’s Train Writing Residencies: Amtrak is offering 24 writing residencies free of charge. They are accepting submissions and are awarding free travel on one of their 15 long distance trains. Each recipient receives round trip travel in a sleeper car, complete with desk, bed, electric plugins and a window for inspiration. Learn more here: http://blog.amtrak.com/2014/03/amtrak-residency-for-writers/. PLAYA: Located in the Lake County, this southern Oregon Outback nonprofit organization supports innovative thinking through work in the arts, literature, and other fields of creative inquiry. Organized in 2009, they began their Free Residency program in May 2011. Learn more at: http://www.playasummerlake.org/index.html. 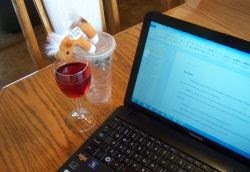 Another great resource is author C. Hope Clark’s newsletter, Funds for Writers: www.fundsforwriters.com. There is a free edition with limited listings or the full newsletter for $15.00 annually. It lists many writing job options, along with retreats. Some offer stipends and several are open to emerging writers. Okay, so you can’t leave town for an extended period of time. Do you have any friends, or friend of friends who own a cabin or condo nearby? Would they let you stay overnight for little or no cost? Or you can grab your best writing buddy, travel to a nearby locale and split the cost of a motel room. Scout out great locations, do some writing and add some critique time as well. How about that nice two-person tent in the basement that’s never been out of the box? Find a park or campground, pitch that baby up for a night and find inspiration in the stars at night. And it you can’t even get away for one night, find a few hours in a park, along a river, near a lake or in the middle of a farmers field. Be creative, be bold and honor your inner writer. With a little research and some innovative planning, who knows where you’ll find your next best piece of writing. Dean Miller is the author of And Then I Smiled: Reflections of a Life Not Yet Complete, currently available in print and Kindle formats on Amazon as well as Nook. You can catch up with Dean's regular meanderings at his website www.deankmiller.com. Great post, Dean--and some good information. I do take weekend retreats with a writing buddy. We go to a cabin a couple of hours from here 2 or 3 times a year. We go when the place has a 3 night for 2 night price. I really like the tent idea! I'm going to be pitching mine and doing some writing this summer for sure. Thanks for the great suggestion. I love the tent idea! Thinking back, I used to do that as a kid, a lot, in the summer. Me, my notebook, a tent, and a little quiet made for uninterrupted daydreams and inspiration! Thanks for the post. Alright...so it looks like we are all pitching tents this summer. What wine goes well with Jiffy Pop? Excuse me, but wouldn't the type of wine be "Wah, I don't want to write in a tent"? Thanks. Tip your service people.